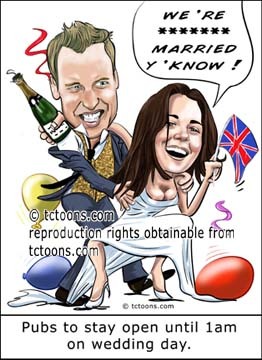 Prince William and kate Middleton drunk at wedding cartoons. Prince William and Kate Middleton royal knees up as pus stay open until one am to ensure everybody has enough time to celebrate their wedding day.Kate Middleton can hold her drink, Prince William supporting her. If you wish to use this cartoon in your publication please click the buy reproduction licence button on the right on my main page. 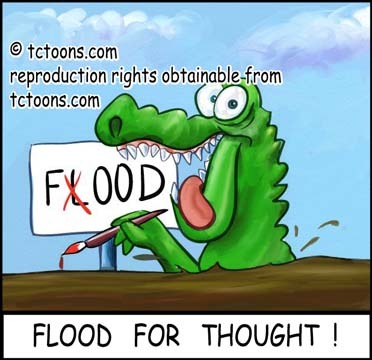 Flood food for crocodiles in Australia cartoon.The crisis has been triggered by Australia’s wettest spring on record. At least six river systems across Queensland have broken their banks. The floods have affected about 200,000 people, and many have been evacuated. People are in danger also from hungry crocodiles now having access to the stranded survivors. If you would like this cartoon for your publication, click the licence for reproduction on the right.